Cycle with the sun on your back and a breeze in your hair on a cycling holiday in Greece. Greece has a great climate for cycling and getting out of the main towns and discovering the Greek countryside is best done from the saddle of a bike. Cycling the Island of Rhodes lets you see a totally different side of the famous holiday island, bringing great hospitality, amazing history and some of the most relaxing moments you will ever remember. For more information on taking a cycling holiday, you can download our Free Guide to Cycling Holidays or check our Online Cycling Holiday Guide. Best suited to relaxing cycling breaks, with plenty of opportunities to stop and savour the food and wine of the destination, a cycling holiday in Greece is the perfect exploration of forests, villages, and coastlines. 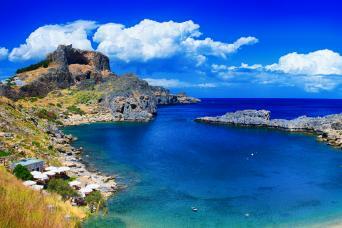 Rhodes is the largest Greek island in the Dodecanese, close to the coast of Turkey and one of the most beloved. Pedal through remote fishing villages, vast pine forests, past sparkling blue seas and many historic places; the Crusader Fortress in Rhodes town, a UNESCO World Heritage Site, the ancient city of Kamiros and the Acropolis of Lindos.